KYU gradings are held at the Bierton Dojo 4 times a year, usually in the months of March; June; September and December. The gradings are held on Sundays and comprise of pre-grading course with the Examiner. F ollowing the course will be the Kyu grading. This is also the time when any presentations are made to the students: DAN grade certificates; best student for each dojo since the last grading; plus other miscellaneous awards that may need awarding. ESP: Is for students who have recently joined TSKC and are beginners - White Belts - who have either missed the previous regular grading or joined shortly afterwards, we have the ESP Grading (Orange stripey belt!). Please click here to find out all about it. What do I need to do before the Grading? Now please read through this info and if you have any questions, refer to the FAQ section below first. If that doesn't give you the answer you can email TSKC here to get your answer. OR Complete the form ONLINE and send direct to me. Examples shown to the right - click pic! Your licence must be current and in date. If it has expired, you will need to renew it ASAP with your club instructor. Take note: This process can take up to 10 working days to return! Submit in plenty of time. Prior to the grading there is a lesson conducted by the Grading Examiner. This is approximately an hour long and the content is aimed at what to expect in the grading as well as some other fun stuff. Aspects of Kihon, Kata and Kumite are covered which tends to put the students at ease and get to know the Examiner. The course is FREE for those who grade and a nominal charge will be made to other karateka who wish to partake in the course only. It is an open course to all Shotokan practitioners. Double Grade. There is a possibility that you may double grade. This is not common and indeed, you need to have performed exceptionally well in order to be asked to do the next grading. There will be an extra cost to you of £10 should this happen. Full Pass. Having passed your grading, on receiving your licence book back from the Grading Examiner, he / she will inform you what part of your karate needs work or indeed what they were impressed with. If your grading is considered as a border line pass then you may be told that you cannot grade for at least 6 months in order to get back up to full potential but you will still receive a full pass. 6 Months. The Grading Examiner feels that you need more training and has stated that you must wait 6 months before you grade again. This will be in addition to receiving a FULL pass and not a Temporary Pass. Temporary Pass. You did not reach the required standard to pass as a full kyu grade. There may have been mistakes in your kata or kumite which needs to be worked on. You will, however, be permitted to wear the belt of the next rank but at your next grading, you WILL have to take this grading again to achieve a full pass. 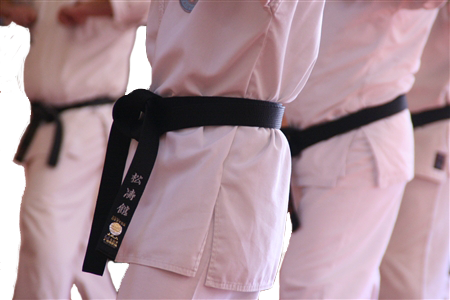 During the period of training leading up to your next grading, you will also be working on the syllabus for the grade of the belt you wear as well as the previous grade. Some time before the next regular grading, if you have been working hard and achieving a very good standard you may be invited to attend an intermediary grading to remove the Temporary pass and attend the following grading on a full pass. You must show that you have been committed to your training and demonstratee you are worth the full pass. Unsuccessful. This is a rare commodity at TSKC I am pleased to say. Students who fall below the minimum requirement to receive a temporary pass will remain on the belt they started with. Naturally, detailed feedback will be given to the student to ensure that they are ready for the next grading. Successful students (double grade / Full pass / Temporary pass) will receive their next belt immediately after their grading and be presented with a KYU Grading certificate in due course. Those students who were Temporary grade before the grading will get their grade confirmed. They have already received a belt and certificate for this grade but if they went on to take the next grade, will of course receive the belt and certificate of the new grade. When do I qualify to grade? In order to qualify to take a kyu grading, certain criteria should be met. Firstly, there is a minimum 3 month period and at least 20 lessons required between each grading. Both must be satisfied. This means that you will need to be training twice weekly to achieve this, especially from yellow belt upwards. A private lesson equates to 3 regular lessons. Shortfalls can be made up here. It is not easy to reach a good standard to grade after 3 months by training once a week. At least 3 days prior to the grading you must submit a Grading Request Form so that a decision can be made to see if you are up to the required standard to take your grading. Your Licence Book and grading fee should be handed in as soon as possible, if not, on the day but this does cause delays. Karateka receiving a temporary grade must take the grading again next time although they can wear the belt of the next grade until then. How long do I need to wait between gradings? As a 9th Kyu to 1st Kyu, you must wait at least 3 months between gradings, however, you must also have attended a minimum of 20 lessons. months. How many gradings a year are there? We have 4 gradings a year. These are usually held in the months of March; June; September and December. When and where will they be held? The Kyu gradings are held at the Bierton dojo. Currently there are two courses, one in the morning for senior grades, the other in the afternoon for junior grades each followed by it's associated grading. However, if the Bierton Dojo is not available to hold the grading, we will use another dojo i.e. Winslow or Medbourne for example. What do I need to submit for my grading? You will need to submit a Grading Request Form at least 3 days before the grading date. This will enable belts to be purchased; courses to be organised and a review of the students to see if they have reached the required standard to grade. Failure to do so may mean that you do not get your belt on the day of the grading. Licence books and the grading fee can be submitted on the day of the grading or anytime before. If you do not have your licence; your licence has expired; you cannot pay the grading fee - you will not be able to grade. Please also note that you must also be a fully paid up member of TSKC. What if I cannot attend but have submitted my documentation? Tell the Chief Instructor before the 3 day deadline or ASAP if after that deadline. After the deadline, an admin fee may have to be charged. Please speak to the Chief Instructor for details. What is a Grading Request Form? Basically, a request - from you - asking to take a grading. In most cases where you have attended the required amount of lessons or more AND waited the minimum amount of time between gradings (3 months), then you will be permitted to grade. However, there may be occasions where students, despite satisfying the prerequisites, may not be up to the standard expected and required for their grade and permission may not be given. This form also enable TSKC to arrange the pre-grading course(s) and purchase the required number of belts and certificates for the students. What if I discover my licence has expired? Then it must be renewed! This usually takes up to 10 working days to receive back. 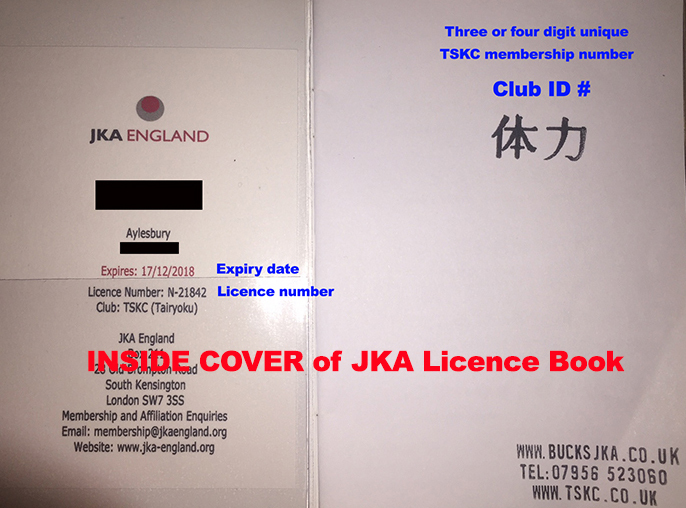 Fortunately, at this time, TSKC is responsible for all of JKA England's licences so you will get yours back much quicker. Where can I get a GRF and / or Licence renewal form? The GRF is available to download or complete online. I have a Temporary grade. What does that mean? At your previous grading you didn't reach the required standard for a full pass but you are permitted to advance to the next grade. In the opinion of the Examiner, you need more training on your previous grade and must therefore re-take that grade again. At the next regular grading you will be required to retake your previous grading to show you have now reached the required standard. Do I have to attend the training before grading? You don't have to if you don't want to, that's your choice but it is recommended. Normally the Grading Examiner will run through exactly what he will be testing you on in your grading. How much is the pre-grading course? What if I am not here for the TSKC scheduled grading? It is desirable that you are graded at your club gradings. If you cannot make the scheduled one, you may have to wait until the next one. It's only 3 months or so. In special circumstances TSKC may be able to arrange for you to attend another club's grading. This will only be approved if you have been training hard and regularly. These may be held in Stevenage or Reading. If I was fortunate enough to double grade, do I have to pay extra for the grading? Yes. If a student performs well enough to double grade, then the additional payment to take this grading is £10.00. If you are a White belt you are able to attend an ESP (Extended Schools Programme) grading, which are held at Bierton on various dates. This is the only Provisional Grade we have and enables new students to experience what is yet to come at a regular grading. It will provide you with the necessary confidence to take your first full grade in front of a visiting Examiner, familiarise yourself with what you have to do and where you have to go. Lesson starts at 10am and the grading will follow. You will be required to submit a Grading Request Form which can be found on the website. Do not forget to bring your licence and grading fee on the day. If you take an ESP grading, there are one of three levels you can pass: Gold, Silver and Bronze. The first will indicate to the next Examiner that you work extremely hard and there may be a possibility of double grading. You will be awarded an Orange belt with a White stripe. Silver and Bronze passes wear the same belt - a White belt with an Orange stripe. The former indicates that you have reached the required standard to take the next grade. A Bronze pass means that you haven't yet reached the required standard to take the next grade but in the coming weeks may do so. You may not be ready for the next grading.